How many struggling writers wouldn&#146;t give their eyeteeth to be in Padgett Powell&#146;s predicament? Since the publication of Edisto, his highly praised 1984 debut novel about a young boy&#146;s eccentric upbringing in the Deep South, Powell has been in lonely competition with himself to fulfill the promise of his first book&#146;s success. Unfortunately, subsequent short story collections and novels (including an oddly muted sequel, Edisto Revisited, in 1996) have failed to build the reputation and readership that were once predicted for this enormously gifted writer. His latest novel, Mrs. Hollingsworth&#146;s Men, is such a radical departure in style from his previous work that one is hard-pressed to ascertain whether it represents a bold new direction for the author or a nose-thumbing retreat into experimental obscurantism. Whatever its intent, the book is unlikely to garner Powell new readers or bring much satisfaction to his admirers. 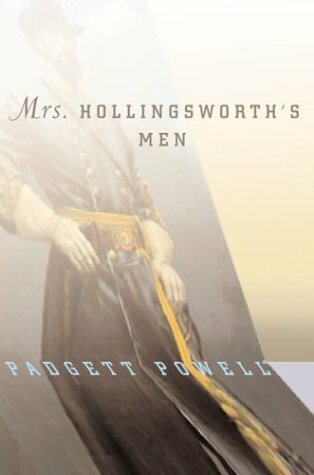 Clocking in at a meager 134 pages (with an inordinate amount of white space), Mrs. Hollingsworth&#146;s Men is divided into dozens of brief vignette-like chapters, many of them less than a page or two in length. The story line is comprised of an allegorical reverie unfolding in the imagination of Mrs. Hollingsworth, a fiftyish suburban mother and wife, as she sits at the kitchen table writing her weekly shopping list. Before long, the images in her head and on the page begin taking on an independent life that both delights and disturbs her. As a kind of paradigm for the art of fiction writing&#151;weaving form and structure out of desire and transgression&#151;Mrs. Hollingsworth&#146;s adventures in storytelling seem in part a celebration of the myth-making capacity latent within each of us. It&#146;s a serviceable theme for a short novel, but Powell works too hard at fashioning a collective unconscious for his daydreaming protagonist. The disjointed narrative touches on weighty cultural themes without illuminating them in any significant way. Because the avant-garde impulse is so rarely represented or supported in mainstream literature, Padgett Powell deserves credit for attempting an energetic experimental work that recalls the 1960s and 70s heyday of writers like John Barth and Donald Barthelme. In fact, Barthelme was Powell&#146;s writing teacher and mentor at the University of Houston in the 1980s. But this isn&#146;t the kind of material that plays to Powell&#146;s strengths of observation and droll verisimilitude. For those who are as yet unfamiliar with what an exceptional writer he is, the strongest evidence is to be found in Edisto, one of the best American novels of the last twenty years.